If you been dreaming of picking up roots, living on the edge, or literally going out on a limb in terms of eco-lifestyle possibilities, then Finca Bellavista: A Sustainable Rainforest Community might be just the thing for you. Located on the base of an almost 6,000 foot primary rainforest mountain on the South Pacific Coast of Costa Rica – not far from the Pan American Highway, Finca Bellavista was created with the sole purpose of preserving 300 acres of local rainforest by offering a unique opportunity for ecologically minded property owners to live sustainably in and steward a managed rainforest environment. With a principle focus of creating a balance between maintaining a fragile habitat for wildlife and using natural resources wisely, Finca Bellavista aims to implement sustainable energy practices such as hydroelectric and solar power, while operating a full-fledged recycling center and a common garden area for the community. This might make it an eco-utopia for some, but for others it’s a possible solution for dovetailing conservation with development. As per Finca Bellavista‘s guidelines on their website, treehouses in the community must be low-impact, stilt-built or arboreal dwellings that utilize a rainwater catch system to provide water for each unit. Waste that is generated is to be treated with “a cutting-edge technology found in biodigestors”. A “hydroelectric turbine system” will power the entire community. The power grid will run via a system of transformers and underground power cables installed along the horseshoe-shaped main access road that runs throughout the community, producing peak power of 62 kilowatts at the generator leads. The power system at Finca Bellavista will produce clean, sustainable, and extremely reliable power for the community, all the while virtually eliminating any monthly electricity bills for residents. Fancy a bit of socializing or Tarzan action? 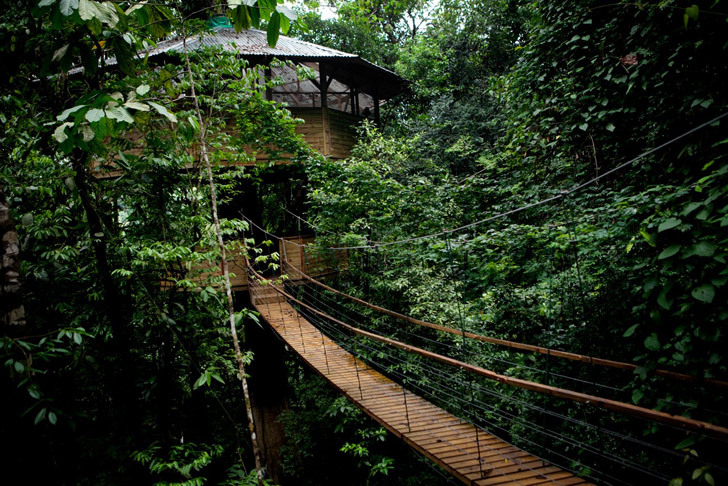 Residents can opt for either the community’s system of ground trails or its ‘Sky Trail’ network of zip lines and platforms that deliver them to and from their homes in the rainforest canopy. Missing the outside world? A main parking lot exists at the community’s base area, where high-speed Internet and WIFI are available. The proprietors state that “these requirements will not only preserve the integrity of the rainforest canopy and its inhabitants, but will also provide an unusual and adventurous lifestyle for human dwellers as well. Imagine waking to the sounds of a tropical bird symphony or catching a zip-line to meet up with friends for a meal or an evening cocktail…” This might be a bit too much of an ewok housing scenario for some, or a real estate development plan that should simply exist as a rainforest preserve, but for now it is on the table as a possibility for how “going native” might be the wave of the future or the cure for what ails us. Really outstanding post. I simply found your blog and foreseen that would express that I have really had a great time exploring your blog parcels. Anyway, I'll be subscribing to your keep up and I believe you post again soon. is the 50,000 for the land with or with out the house ?? Do I need to have $50.000?? I Really wanna live like this!! Awesome!!! what if the tree is falling? Does anyone know the name of the architect or city planner that designed Finca Bellavista? Does anyone know who the architect or citty planner was the one who designed the Finca Bellavista? Terra Verde....This project is in 'America' since its in Costa Rica. Maybe the word you were looking for is 'United States'. I find nothing 'sustainable' about this or 'green'. I think the copying of indigenous housing types and providing it to jet-traveling, business moguls is not in any way sustainable. Further, placing objects in nature does not make it 'green' or 'sustainable'. The way these words are being used they have the same value as 'electrolytes'. A sustainable revolution should not take place in marginalized regions of the world but in high density urban regions where small gains in efficiency multiplied millions of times translate into large cuts in energy use. Furthermore, second homes are not sustainable. Lets not render our sustainable future to the taboo housing types or high-minded eco-fashion. Turning your TV off when you aren't watching is so much more effective. further to Christopher P.'s comments, the minimum setback is 30' from the edge of your property, but he is forgetting to include the MANDATORY 50 METRE protection zone that buffers any property from the river. Hence, the closest anyone could build their house to the rivers would actually be more like 195 feet (50 metres PLUS 30 feet), not the 30 feet like you claim. I hope this helps clarify things for people and that Christopher will do a little more homework prior to making negative statements in the future. My wife and I also bought at the Finca and we have this to say: We would encourage you all to read the development guidelines if you are unsure of just how serious the hogan's ar about building a world-class ecovillage. You will find that there is much more than just a 'vision statement', and that there are several policies owners must follow -- all of which are designed specifically to ensure our environmental footprint remains as small as possible. This alone is something that virtually all North American developments fail to do. On top of that, the environmental review board does take its job seriously and, even though the guidelines technically allow for large dwellings, that is only a result of each lot being very large. The percentage of allowable built-out space is just a small fraction of what most comparable developments allow. On top of that,the likelihood of any owner in the finca building a 10,000 sq.ft McMansion is actually very low as all of us are deeply committed to sustainability. Most houses will be in the 500-2000 sq.ft range spread out over the forest. Even a 2000 sq.ft house in the middle of your property would virtually disappear in the dense rainforest. As for accessibility options, the basecamp IS being designed to accommodate handicapped and elderly folks. Mind you, it may not be the destination of choice for old people -- but that's no different than saying that single people might not like attending a 'couples only' event -- that's just life. Beyond the basecamp, it's the choice of individual owners how accessible they wish to make their homes. The whole thing is very exciting and I hope all of you get to come and visit sometime to see for yourselves. Kevin. 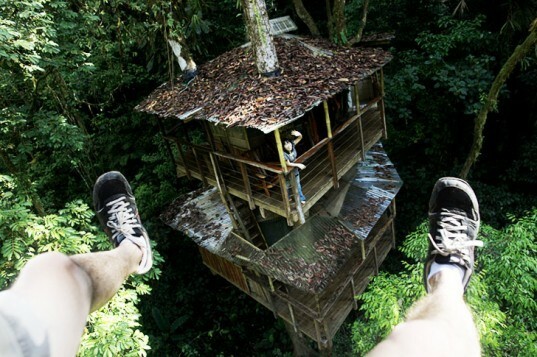 doesn't this remind anyone else of that tree top houses part of the game Myst? But what about the Elderly or handicapped or sick. Wow! I would LOVE to live there. It reminds me of the game MYST. There was a world where the prior inhabitants lived just as these pictures describe. AMAZING! What a beautiful surprise! This is the type of conscious effort and progressed planning that sets a new standard of possibility....who else will step up to the plate? Which (if any!) North American Developers have the Vision, Courage, Determination, and Wisdom to follow in these very large footsteps..... show of hands anyone? Hmmmm, that would be interesting to see, wouldn't it? But I wouldn't hold my breath on that one (sigh). The dilemma of tree houses is their impact on healthy trees. I feel uncomfortable pounding nails into trees to support a tree house, and feel that using a clamping method kind of strangles the trees as well. And there's the added weight pressing downward. There's got to be a 'holistic' way of situating tree houses amongst vibrantly healthy trees. I just haven't encountered it yet. Shigeru Ban could come up with a solution, I'm sure. Maybe a web of tension 'cables', that were adjustable, so that trees could keep on growing unabated would work ? (A variation on the B.Fuller '4-D Timelock' design ?) A variation on suspension bridge designs ? Tree houses are cool.....with all the water fallls in the area... Falling Water (Frank LLoyd Wright) comes to mind. How can I live there?!!!!! I was thinking "George of the Jungle".... Seriously, according to the rather liberal Planned Unit Development-type guidelines, although the initial offering is in 2 or 3 acre sites (equating to between 100 and 150 homesteads, worth between 5 and 8 million USD to the Hogans), the dwellings thus envisaged could be, following these guidelines, on the order of 16,000 to 24,000 square feet of built area.... more "Xanadu" than "bungalow"! The minimum setback from the two waterways is only 30 feet, hardly conducive to protecting their ecology. No paving standards are identified, and, in this "protected rainforest" environment, the only provision for tree protection is that any tree removed MAY be required to be replaced in another location on the site -- which if the review board (or chairman of the review board) is so inclined can mean the replacement of scattered canopy with what would amount to a privacy hedge along the edge of the property. There does not appear to be a master plan, only a vision-statement. Furthermore, there is implied in the design guideline a potential density of approximately 8 units per acre (1000 sf of building per 5000 sf (50'x100' according to the guidelines) lots-- more on par with an older Los Angeles suburb than a nature preserve. That being said, Costa Rica generally has the reputation as being one of the more environmentally progressive countries, and has a history of striving to protect its lands and peoples. It also appears that the Hogans have purchased a fallow farm area and are attempting to reclaim some rainforest qualities of the property -- although this seems more like a managed PUD than preserve. OpenEco looks like it's worth a message in Inhabitat. It is a good tool to help reduce GHG's and such! Looks beautiful! Has anyone on this blog checked out www.openeco.org yet? They have a lot of solutions for calculating your carbon footprint and ways to reduce them. Just thought I'd spread the word to those who took the time to read this insightful article. I would pay just about everything I own just to live in a place like that in America. *sigh* Possibly the most beautiful thing I've ever seen. I dunno if I would want to live there full time, but it certainly seems like a great place to retreat to, or spend a few weeks just recouping from the stresses life brings. I wonder what the shower/toilet situation is...and what happens if I'm cooking in the kitchen and I start a fire? Wow - I had the same thought as the comment above. This is a real Ewok village. 'Ewok' was my first thought, I'll admit. But on reflection it looks much more like something out of the Donkey Kong games. Either is fine with me. If you been dreaming of picking up roots, living on the edge, or literally going out on a limb in terms of eco-lifestyle possibilities, then Finca Bellavista: A Sustainable Rainforest Community might be just the thing for you. Located on the base of an almost 6,000 foot primary rainforest mountain on the South Pacific Coast of Costa Rica - not far from the Pan American Highway, Finca Bellavista was created with the sole purpose of preserving 300 acres of local rainforest by offering a unique opportunity for ecologically minded property owners to live sustainably in and steward a managed rainforest environment.